Running down the field, South alum Mike Hirsch makes his first play as a Wolverine. Hirsch graduated from GBS in 2010. 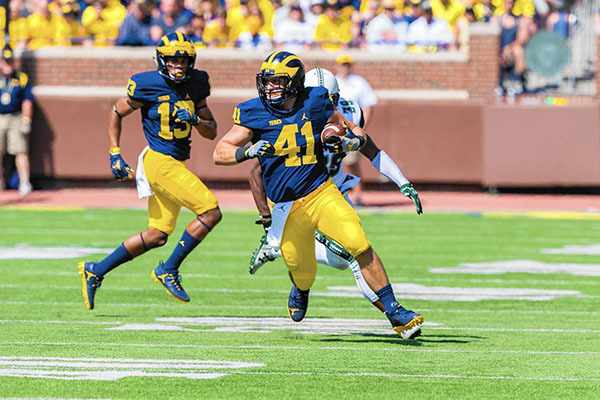 South alum Mike Hirsch always dreamt of being a football player, of running out of the tunnel into the Big House, of being a Wolverine, and of attending the University of Michigan like his parents did. The generational love for the school and its football team mesmerized young Hirsch, and the trips to games with his parents had made U of M his dream. However, Hirsch didn’t end up fighting for a spot on the team until years later, at age 24. A graduate of the class of 2010, Hirsch had a successful football career at South, leaving the school with 3,375 rushing yards and 50 touchdowns as a fullback. The Titans were frequently ranked in the top 25 in state, according to Hirsch, and in his senior year, the team made it to the state quarterfinals, losing to Maine South 44-23. Hirsch says one of his favorite memories from GBS is walking through the halls in his jersey on Fridays before games. Upon leaving South, Hirsch was faced with a decision to make. He had committed to play football at Harvard, but head coach at Michigan, Rich Rodriguez, offered Hirsch a walk-on spot to play at the school he had dreamed about since he was young. It was an enticing offer, according to Hirsch, but he couldn’t bring himself to decommit from Harvard. But in the spring of his freshman year at Harvard, during a practice, Hirsch noticed something was wrong. What was thought to be just a cold turned into something more serious when Hirsch started to spit up blood. After seeing a multitude of doctors, Hirsch was diagnosed with Wegener’s Granulomatosis. According to Mayo Clinic, Wegener’s produces inflammation in the blood vessels in the nose, sinuses, throat, lungs and kidneys. This can cause slowed blood flow to some organs, affecting the ability of these organs to function normally. With football out of the question, Hirsch remained a student at Harvard and eventually graduated in the class of 2014. After working for a year and a half, he realized he wanted to prioritize and set goals of things that were really worthwhile and meaningful. That’s when Hirsch decided he wanted to go back to football. Michigan football. After months of emailing Michigan coaches, Hirsch got no response. A campus visit eventually got Hirsch in contact with the coaches, as he had reached out to Ben Gedeon, a friend who played at Michigan. Finally, at the end of a day of work in New York, Jim Harbaugh’s phone number popped up on the screen of Hirsch’s phone. Harbaugh’s call confirmed that Hirsch’s medical case, proving that he was sick, had been cleared. He had met with the Michigan head coach once before, in which he was offered a spot on the team, and needed the case to go through to be able to play. 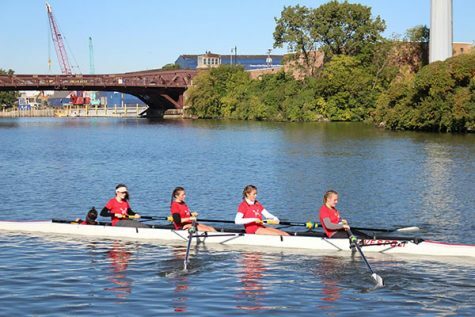 After requesting a year-long sabbatical from his job on Wall Street, Hirsch trained for a few months before heading to Ann Arbor to pursue his childhood dream. Hirsch went on to play in three games that season, against Hawaii, UCF and Illinois. In the rest of the season, Hirsch played on the scout team, going up against multiple athletes who are now in the NFL, such as Jabrill Peppers and Vidauntae Charlton. Hirsch wasn’t ready to be done with football upon graduation from South and years later, his dedication to the sport helped to make his dream come true.